Journalists Stevie Cameron, Michael Enright and Andy Barrie are apointed to the Order of Canada. Can this sign save the Globe? 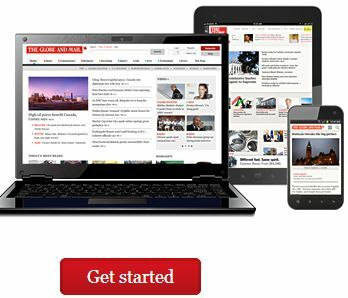 The Globe and Mail has a lot at stake in its recent effort to get people to pay for reading the newspaper online. The desperate measure of showing readers an image asking them to pay, rather than showing the story, has become known in the industry as the paywall. Today the Globe is thumping the paywall tub again starting off with a brave little conceit that Apocalyptic Mayans didn't see the end of the world, but they are seeing the end of news for free online. Then there 's U.S. commentator Dana Blankenhorn who says investors should short the New York Times because its paywall -- and paywalls everywhere -- haven't got a chance. Blankenhorn says paywalls are only a temporary fix. He quotes Matt Ingram of GigaOm as saying that the Times is only maintaining with its paywalls, not prospering. "The paywall acts like sandbags against the flood. They keep the floodwaters out but they don't stop the rising water. In the case of newspapers, this flood is an unsustainable business model. As Clay Shirky noted, in the debate over the Washington Post adding a paywall, sites like Homicide Watch cover every killing in the area, with a staff of two, while the Post newsroom has dozens of reporters but just covers a handful of cases a year. As Shirky wrote at his own blog last year a newspaper is a bundle, but the nature of the online world is to tear such bundles apart. The easy part of a paywall is getting money from 2% of your audience, he adds. The harder part is replacing 98% of your advertising business." There used to be advertisements for evaporated milk from contented cows, oatmeal that would control your weight, throat-cooling cigarettes and three-for-10-cents cigars. Those vintage spots ran on CBC Radio back in the 1930s and 1940s, and while the notion of ads on Canada’s public radio programs might today seem as oddly foreign as those vintage examples, contemporary listeners will have to get used to the concept. In 2013, advertising will return to CBC Radio 2 and to the French-language Espace Musique if the public broadcaster gets the go-ahead from federal regulators. Listeners could start hearing ads as early as May. A newspaper’s interactive map listing the names and addresses of gun permit holders in two New York counties has drawn a gathering avalanche of outrage. As word spread across social media, thousands left comments expressing disbelief and anger at the map, compiled from publicly available information on handgun permit holders in Westchester and Rockland counties and published online over the weekend by The Journal News, a newspaper based in White Plains, N.Y., and owned by Gannett Co.
What do we mean by "impact on the news"
It's up to Canadian Press of course if it wishes to describe Luc Magnotta as its Newsmaker of the year. The problem for a lot of people who are now excoriating CP for this choice is that Mr. Magnotta was such a crashing nobody. It may be possible to stand above all others in impact on the news starting from Mr. Magnotta's undistinguished obscurity but frankly it's a challenge, in our view. Scott White, editor in chief of CP, cites Newsmakers like Ben Johnson and Russell Williams to justify the choice of Magnotta as this year's Newsmaker. Gee, it hardly seems possible he can't see the difference. Mr. Johnson was an otherwise decent enough person, poor and Black, who won great Olympic honour. Canada gave him its heart. Then he fell an incredible distance to earth when it was discovered he had taken dope. Tragedy defined and worth of every bit of the breathless interest shown by Canadians in the story. Colonel Williams could hardly have exhibited a more Shakespearean tumble. His horrifying crimes revealed not simply his depraved mind but an astonishing double life as one of the country's most prominent military men. His arrest shook the RCAF to its foundation. Worthy of the CP Newsmaker?. You bet. We suppose Bob Rae's point might be that while "impact on the news" is subjective, it probably requires more than Mr Magnotta brought to the news to be named Newsmaker of the Year. More than 30,000 Americans have petitioned to have Piers Morgan deported. The latest in the White House petition follies: Send CNN television host Piers Morgan back to Great Britain. More than 32,000 people have signed the petition on the White House website calling on President Obama to deport Morgan over his support for new gun-control laws after the Connecticut elementary school shootings. Morgan "is engaged in a hostile attack against the U.S. Constitution by targeting the Second Amendment," the petition says. "We demand that Mr. Morgan be deported immediately for his effort to undermine the Bill of Rights and for exploiting his position as a national network television host to stage attacks against the rights of American citizens." The selection of Luka Rocco Magnotta as Canada’s 2012 Newsmaker of the Year lit up the country’s social media and news web sites on Sunday with a cyclone of outrage and condemnation. The alleged killer, who now sits in a Montreal detention centre as his case goes through the legal process, was the subject of a global manhunt last spring after a Chinese engineering student was killed, his body cut up and remains mailed to four different locations in Ottawa and British Columbia. The event, including Magnotta’s capture last June at a Berlin internet cafe, was splashed across newspaper front pages and Web sites all over the world. Mr. Magnotta was chosen in the annual poll of the country’s newsrooms by The Canadian Press. Cogeco Cable Inc, the main unit of media and telecom company Cogeco Inc, will buy Peer 1 Network Enterprises Inc for about C$526 million to expand its cloud computing and data hosting business, Ruters reports..
Cogeco Cable, which provides cable-TV, high-speed internet and telephone services, has been looking to increase its presence in the fast-growing data-center business due to tough competition in signing up new television customers in Canada. The council also ruled that David Menzies’ comments about Star reporter Daniel Dale, calling him “effeminate,” were not abusive. On May 6, Menzies (centre) appeared on Newstalk 1010’s The City with Rob Ford featuring the mayor and his brother, Councillor Doug Ford. Menzies complained about the abuse Rob Ford receives, recalling a question during the 2010 mayoral campaign when someone asked about his obesity and the possibility of having a heart attack in office. Menzies hypothesized about asking a similar question to Smitherman, then a mayoral candidate. The council ruled that Menzies’ comments about Smitherman, who is openly gay, violated several provisions in its code of ethics. A Golden Eagle snatching a child from a park? No.The hoax was perpetrated by kids at an animation design school called Centre NAD. A blog posting identified four students at the Montreal 3D animation and digital design school as being behind the hoax, which it said was part of a school project. "The child and the eagle were created using 3D animation by the students and then dropped into real footage," it said. Did coverage of Newtown disgust you? It's your fault if you believe phony "news"
According to Chris Kelly, producer of the CBC fake news program This is That, it's more or less your fault is you believe much of what it broadcasts. Kelly appears to bring a whole new school of thought to the field of journalism ethics. This week the program ran a story, complete with a fake interview, that a Montreal Councillor was insisting that dogs in Montreal parks should be able to respond bilingually to commands. It was a ridiculous idea but it came from a place where there are many ridiculous ideas about language. It's hard to imagine that anyone who ran the story really believed such a mental feat is possible for canines. But it was -- and is -- entirely possible that Quebec can generate ideas of this quality. The daily news run is loaded with stories which are ridiculous but which are also true (how quaint). Kelly is unfazed. "We obviously feel for the City of Montreal and city council who are probably getting some calls right now. We feel bad that that was an outcome of this, but it's a joke. A pretty funny one," said Kelly. "The overarching truth that we've noticed about this style of stuff is we live in a very knee-jerk age and people sometimes don't take the time to go beyond the 140 characters," Kelly said. Private television broadcasters are warning that local stations can’t continue to exist on advertising revenues alone, after the Supreme Court of Canada ruled the stations shouldn’t be paid for their signals when they are rebroadcast by cable and satellite companies. Local television stations in Canada – including those operated by corporately owned CTV and CanWest Global as well as a handful of smaller independent players– send their signals out into the world in a way that they can be intercepted and rebroadcast. Cable and satellite providers capture those signals, and then offer them to their subscribers. The local stations were poised to get paid for those signals after years of lobbying the federal regulator, but the Supreme Court on Thursday said the CRTC does not have the authority to force the companies to pay for the signals. The decision leaves stations around the country scrambling to find a new way to pay for local news and programming. Supreme Court kills fee-for-carriage scheme! Briefly stated, the Supreme Court of Canada has decided that requiring the program suppliers to pay cable companies a fee to carry the programming is outside the jurisdiction of the Canadian Television-radio and Telecommunications Commission (CRTC). You will recall the vitriolic advertising by both sides of a couple of years ago when this issue reached a fever-pitch. Cable called it a tax on the user, broadcasters said it was merely fairness. In denying the fee-for-carriage plan, the high court has said it violates the terms of the Copyright Act. Call lawyer Brown. Few of us will know what this means exactly. But for the foreseeable future, no extra charges for watching programs. A newspaper in Singapore is offering grieving pet owners the opportunity to share their goodbyes to a loved pet in an obituary. The Straits Times, Singapore's largest newspaper, is now allowing grieving pet owners to publish obituaries for their beloved pets that have crossed over into the Rainbow Bridge. The memorials will be placed in a "pets corner" of the newspaper's classified section. Reportedly, Singapore's population amongst the wealthy are having fewer children and are showering more attention on their pets. Telus Corp. is suing wireless new entrant Mobilicity for what it alleges are “false and misleading” claims made in a new television advertisement. Vancouver-based Telus, which filed its notice of civil claim with the Supreme Court of British Columbia, is seeking an injunction to block Mobilicity from running the TV spot, which began airing across Canada in late November. The lawsuit, which comes during the height of the pivotal holiday shopping season, signifies how competitive wireless carriers have become in the smartphone era. Although Mobilicity‘s ads do not specifically name Telus or any other wireless competitor, Telus claims the spot contains a trio of “misrepresentations” that damage its brand. In particular, Telus is taking issue with the commercial’s claim that “what you see isn’t always what you get” with other wireless networks with respect to unlimited offers. Moreover, Telus alleges that Mobilicity claims to offer wireless services with “no contracts” even though its services are governed by service terms and conditions. The lawsuit also alleges that Mobilicity makes a “false” claim of offering unlimited data – even though its data plans are subject to a fair use policy that authorizes the carrier to use throttling to slow down the data speeds of heavy users. Australian media called for a halt to the blame game Sunday after a wave of global outrage over the death of a nurse who took a prank call at the hospital where Prince William's wife Kate was being treated. Britain has reacted with horror to the death of mother-of-two Jacintha Saldanha, 46, who is believed to have taken her own life after she was duped by two Australian radio presenters seeking news on Kate's pregnancy. She was found dead on Friday, days after she answered a call at the hospital from hosts at Sydney's 2Day FM radio posing as Queen Elizabeth II and William's father Prince Charles. Saldanha put them through to a colleague who divulged details of Kate's recovery from severe morning sickness. The private King Edward VII's Hospital blasted the stunt as "appalling", with the death unleashing a torrent of online anger directed at presenters Mel Greig and Michael Christian, who have been taken off air and are in hiding. While acknowledging the death was a terrible tragedy, Australian media said Sunday "this is not a time for hysterical finger-pointing". Somalia has long been unsafe for journalists but now it’s worse than ever. With 18 reporters and media workers killed so far this year, it is the most dangerous dateline in Africa. And while foreign journalists are sometimes targeted, it is locals who are most at risk. A report released last week by the National Union of Somali Journalists listed 44 reporters killed since 2007 and said another 250 had fled after receiving death threats. Those remaining are struggling to do their jobs in a country hostile to their profession. “It has reduced journalists into silence, damaged the quality of independent reporting and instilled fear in the hearts of journalists who would dare to report on critical issues,” Omar Faruk Osman, secretary-general of the Somali journalists’ union, said in an email. The Globe's columnist Simon Houpt argues that the CBC needs more and not less funding and that it should get out of commercials altogether. "But one issue proved a lightning rod (at the recent CRTC hearings): the proposal to allow advertising on its Radio 2 service. And if the complaints about it were correct, the complainants’ solution – to keep Radio 2 ad-free – didn’t go far enough. "The CBC needs to ban ads entirely from all of its airwaves. "Why? First, some background. Fans of CBC abhor the idea of ads on radio. At a press event held by the Friends of Canadian Broadcasting a few days before the hearing, actors Gordon Pinsent and Eric Peterson, and the bestselling author Vincent Lam, argued passionately for the need for a commercial-free space."